Chicken parm, you taste so good! 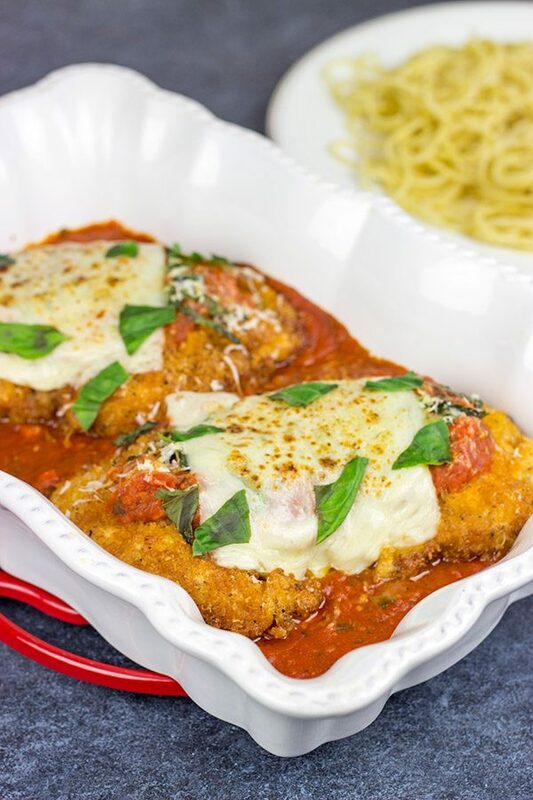 This Classic Chicken Parmesan recipe is the perfect comfort food for chilly winter days! One of the first things that Laura and I realized when we moved to upstate New York is that every restaurant has chicken parm on the menu. You think I’m kidding? Even the Chinese place around the corner has chicken parm. Not that I’ve actually ordered it or anything…but it’s there. You know, just in case you go out for Sweet and Sour Pork, but decide to call an audible and go for Chicken Parm instead. Several years ago, Laura stumbled across a little Italian restaurant down in Schenectady. And when I say little, I mean little. This place has maybe 10 tables…maybe. It’s dark. It’s somewhat cramped. And it has some of the best Italian food I’ve ever eaten. At the front of the restaurant is a long bar, and you have to walk past the bar and through a nondescript door in the back to get to their dining room. This is the kind of restaurant where you’d expect to see Vito Corleone…or Jimmy Hoffa. Speaking of famous people, the walls of this tiny restaurant are packed with photos of the owner and all sorts of famous people. Like any good Italian restaurant near New York, the walls are filled with photos of New York Yankee legends, both past and present. But this isn’t just a sports bar. There’s a signed photo of Marilyn Monroe. Last time we were there, I spotted a photo of the owner with Lady Gaga. Seriously!? We’re talking a tiny hole-in-the-wall type of restaurant with 10 tables…maybe. Needless to say, this place gets a 10/10 on atmosphere on character. And this place gets an 11/10 on it’s food! Every time we go, I order the chicken parm, and I end up with enough leftovers for another entire meal at home. (This may or may not have something to do with the basket of Italian bread that I polish off each time…but I digress.) 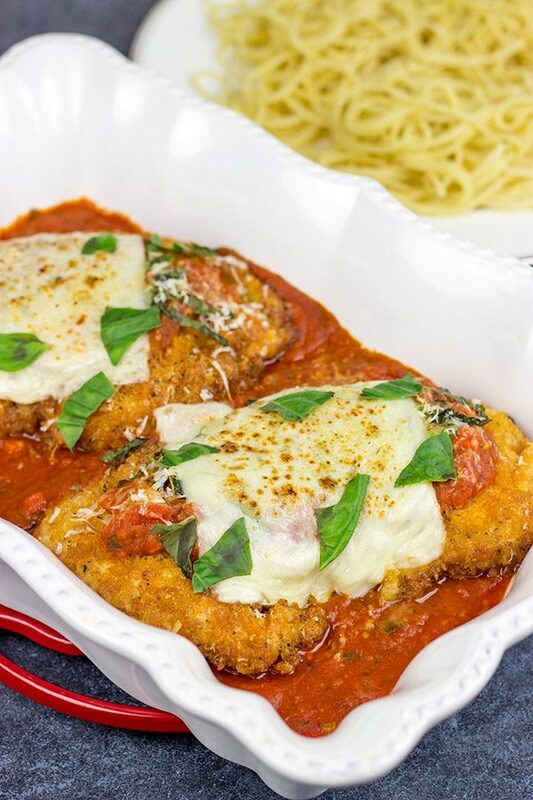 I was thinking about that restaurant chicken parm the other day, and I decided it was time to post a Classic Chicken Parmesan recipe. After all, I live in New York, and I’m married to an Italian gal. That right there means I better know how to make a darn good Classic Chicken Parmesan! We don’t fry food all that often here, but sometimes there are exceptions to the rule. And to make a Classic Chicken Parmesan, you’ve just got to make an exception. “Chicken Parm, you taste so good.” To be honest, making this Classic Chicken Parmesan is rather simple. It does require several dishes as you need to batter and bread the chicken breasts, but it’s worth it. This is one of those comforting meals that’s perfect for a cold winter day. When Laura walked in the door from work and saw that I’d made chicken parm for dinner, she busted into a spontaneous dance. Yep, this chicken parm recipe is dance-worthy! Meanwhile, spray a 9”x13” baking pan with nonstick spray. Spread half of marinara sauce into bottom of pan; set pan aside. Working with one chicken breast at a time, lay it between two pieces of plastic wrap and then pound thin using a kitchen mallet until ~ ½” thick. (Tip: A rolling pin works great here…just make sure to clean it with soap and water afterwards!) Repeat with remaining chicken breasts. Spread flour onto large plate. 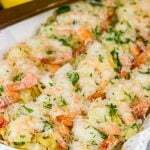 On a separate plate, combine the breadcrumbs with ½ cup of Parmesan cheese. Pour beaten egg into a separate shallow bowl. Fry chicken for 3-4 minutes per side, or until both sides are golden brown. Remove chicken from skillet and place on top of the marinara sauce in the prepared baking pan. Pour remaining marinara sauce on top of chicken breasts. 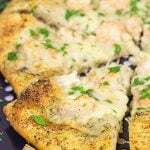 Sprinkle chopped basil on top and then lay sliced mozzarella over chicken. Finally, sprinkle remaining ¼ cup of Parmesan cheese on top. Bake at 425° for 10-15 minutes, or until cheese has fully melted and started to brown. 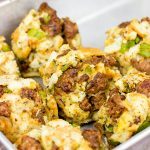 I used store-bought marinara sauce for this recipe, but if you want to make a homemade sauce, then check out this post. That homemade sauce is easy and delicious! 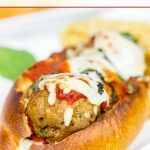 Looking for more delicious chicken parm recipes? 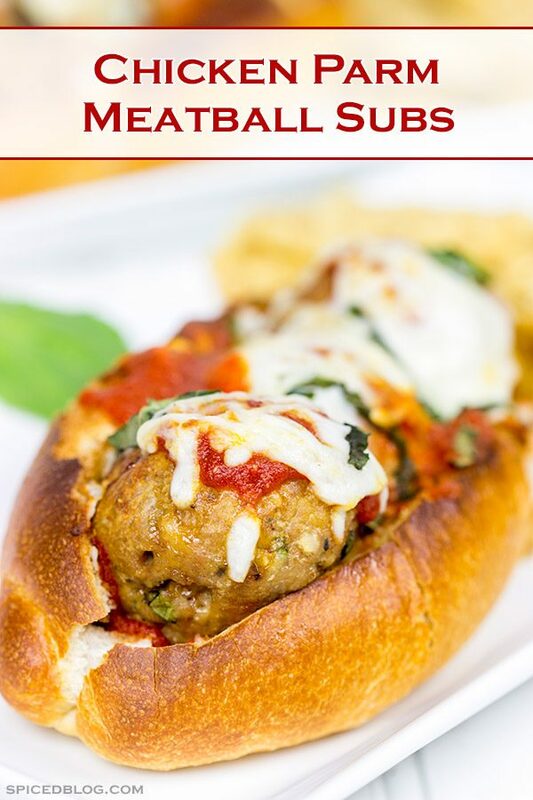 Check out these Chicken Parm Meatball Subs! Oh my goodness – now I feel I NEED chicken parmesan today! This droolicius concoction is most definitely dance-worthy (I say this as I’m virtually high fiving Laura). Now onto that Chinese place that sells chicken parm – whaaaat??? Part of me feels I need to try that because – do they soy sauce it up, or sweet and sour it up? Or, something? Or …is it one of those menu items that don’t sell often so they recycle??? 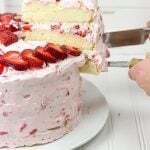 GAH – never mind, I lost the need to try it – I’d much rather come over to y’alls place and have this instead! 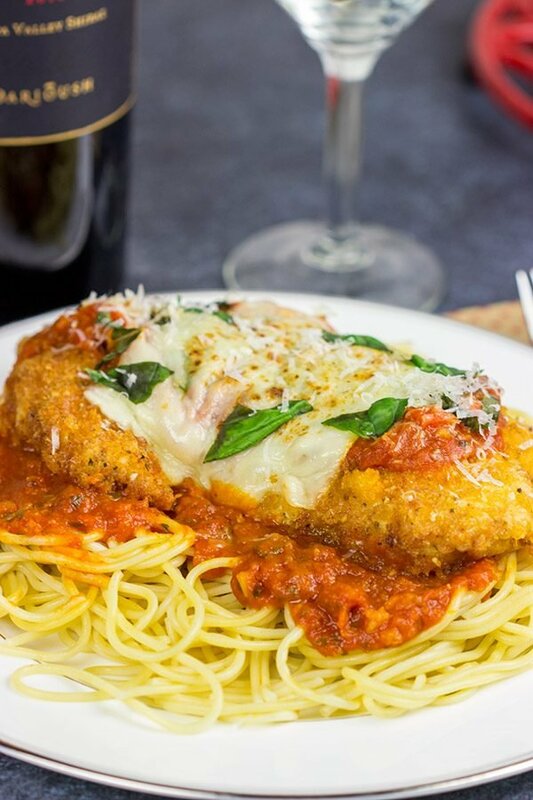 Yum, this chicken parmesan looks amazing. I haven’t made in a while, now I know that I have to put it on the menu. 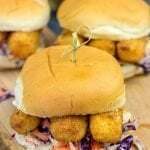 Those little holes-in-the-wall always have the BEST food! The best restaurant in my hometown had about 10 tables too, and their salmon was so good I still tear up a little thinking about it. And don’t even get me started on their spaetzle! The best! As I’m sure this chicken parm is. It looks good enough to please even Peyton Manning :). Happy Monday! You’re so funny with your Peyton commercial, David. I like him too, but did not love his Super Bowl win to retirement because that was the year the Panthers lost! Boo! This chicken parm sounds like a win though! I would love to visit that little restaurant too! Ah! I didn’t think about that. I’m sure you figured out who Peyton Manning is by now, but that’s like you mentioning a Scottish football player…I’d have no clue! I actually remember your Italian restaurants there in Scotland, Neil. And funny enough they were really good. Maybe we got lucky? Laura and I decided it’s because Scotland is close(r) to Italy so they can get authentic ingredients. 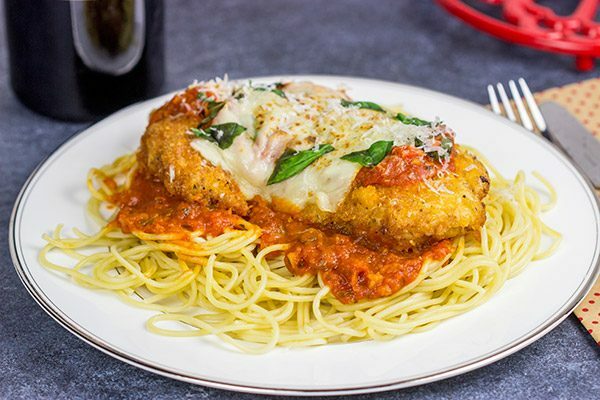 Either way, this recipe is terrific if you’re in the mood to tackle chicken parm at home! Thanks, Neil! That sounds like my kind of restaurant and this is definitely my kind of dish! 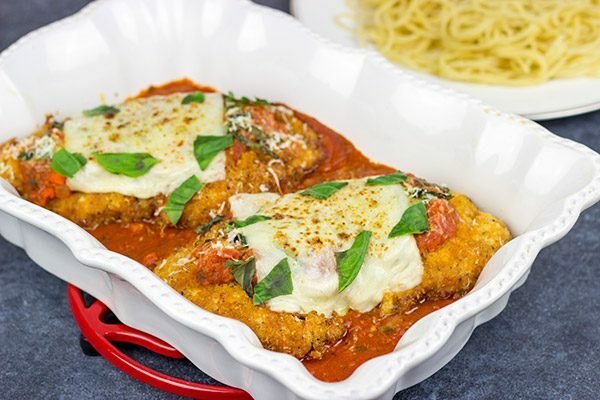 This chicken parmesan looks amazing! There are certain foods that just need to be fried….this is one of them! I should’ve grabbed photos of that little Italian restaurant…it’s so hard to describe! But it really is the kind of place where you have to walk all the way through to a little sitting area in the back. Kinda nuts. And way delicious! Thanks so much, Kathy!! Hey, I totally get it, Mary. We had a somewhat limited menu growing up, too. There’s so many awesome foods that I didn’t discover until later…but better late than never, right?? Thanks so much, my friend. I hope your week is going well so far! Peyton Manning is really funny, and he does seem like a nice guy. Glad he was able to retire without being accused of anything, plus still has his brains in tact! Great story about this restaurant. It looks like a wonderful recipe. I just have never been able to used anything jarred like a marinara. I don’t care how busy I am, I make it from scratch. 3 ingredients. Badaboom. Done! HAHAHAHA, do you remember Peyton Manning’s SNL appearance? The skit where he was kinda being a D and coaching those little kids? Hilarious. Whelp, once again you have me drooling all over my desk because of one of your recipes. I haven’t had chicken parmesan for ages. AGES! I’m gonna need me some of this!! Yes! I do remember Peyton’s SNL appearance. In fact, I just stopped and found it online and watched it again. Now that’s the way every Monday morning should start! 🙂 Also, chicken parm needs to happen in your house…and soon! It tastes so good. And it’s Peyton approved! I love chick parm and have never made it at home so thanks for the recipe! Do it, Jeff! This chicken parm is WAY better than anything you’d order out at a restaurant. In fact, I’m kinda wishing I had some leftovers for breakfast right about now…haha! I’m totally in with you for Peyton’s contribution to the world of comedy. Have you seen some of his snl shorts? Or really about anything, he’s hilarious! It’s funny your restauraunt reminds me of coney island here in downtown where you can actually enter in through the back door, walk by the dishtank and a stove before you come out to the actual dining area. I would sure think your recipe does that restaurant justice because it looks pretty darn delicious! Peyton’s SNL skits are hilarious! I love his dry sense of humor. It’s totally how I like humor. The kind of one-liner that you don’t immediate realize is a joke…and then you’re dying laughing. Also, restaurants where you can come in the backdoor are pretty much 100% guaranteed to be delicious! 🙂 Thanks, Matt! Chicken Parm, you look so good! These parms are gorgeous, David! I have a confession to make, though – I’ve never made Chicken Parm. I’ve never even ordered it in a restaurant. Now I’m planning to make this recipe and my family will be saying, “Where has this been all of our lives?”. (We don’t have any Italian grandmothers😕. Thanks for the recipe! Making it soon! I’m cracking up that even the Chinese restaurant has Chicken Parm on the menu! It’s a dish that I love, but haven’t made it at home. Your version looks simply spectacular! This was fantastic! My Italian husband was very happy. The only change I made was I browned the chicken a little less than what the recipe stated, it was browning pretty quickly. Other than that I followed it to the letter and will definitely make again! Hey Anna! Thank you so much for stopping by to leave a comment. I’m really glad you enjoyed this one. 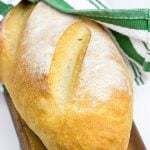 It’s a classic…and it’s delicious! It tastes so much better when it’s homemade, right? 🙂 Cheers, and I hope you have a great weekend ahead!